Eight months have gone by, Polk County Fair is over, and in the next couple of weeks it would be Joshua’s 14th birthday. My parents and I got to hand out ribbons, halters and a plaque in memory of Joshua at the sheep show yesterday. The plaques had his picture on them and his name. It was really awesome to get the opportunity to do that. 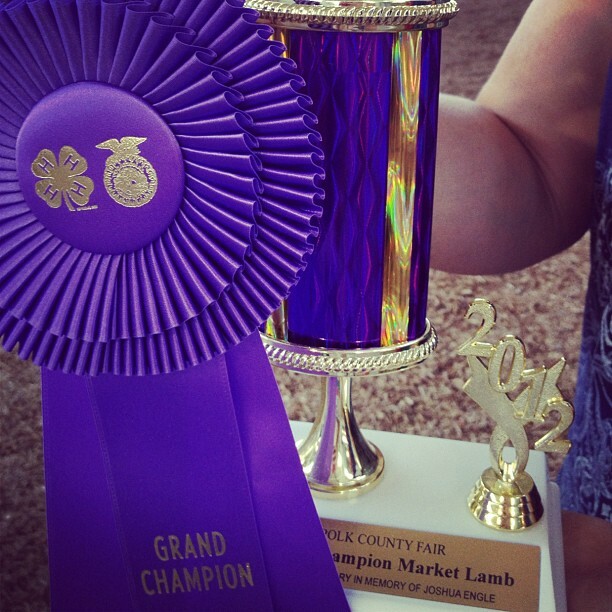 My parent’s also got to hand out the Grand and Reserve Champion Market Lamb Trophy with “In Memory of Joshua Engle” engraved on it. It was a hard day for our family last week and yesterday. The perspective of life has completely changed. Doing things that we always did as a family seems so different now. Joshua was only one person, but had the personality and heart of many. He literally lit up a crowded room. Doing things without him seems so different. When my siblings and I do things, it is so weird to only make room for five. Our home feels empty and life’s events are hard. When I think about last week at county fair, it didn’t seem at all the same. In the next couple of weeks it would have been Joshua’s 14th birthday. Knowing how badly he always wanted to drive, this is going to be another difficult time. He loved cars, and he especially loved trucks. He claimed to be a “Ford Truck Man”. My other brother, Jessi, always assuring him that Chevy is best, he couldn’t drive yet, and that he was in no way a man, still makes me smile. They would always bicker back and forth on which is better, Chevy or Ford. The little conversations and life happenings that bring back my brother are the moments that I hold dear. Joshua has made a tremendous impression on the hearts of many. He was and is truly loved by so many. Reading stories his friends write, seeing pictures, sharing memories and hearing what an awesome kid he was is what makes me proud to be his sister. Always wanting to follow in my footsteps with 4-H, Simpson College and many other things makes me feel like I did a good job. I can still hear him saying, “Hey Bear, watch this!” every time I look at his pictures. He was always so eager to get my attention and approval in all that he did. If you knew Joshua, you know the big heart that missing and the smile that could cheer up any day, no matter how bad it was. If you didn’t know Joshua, I hope that by reading about him you feel as though you did know him. Keep doing your part and spreading awareness. Life is precious and it can be taken away in an instant. I am amazed at how technology has completely changed the world as we know it. If not for facebook and a friend simply liking a post from somewhere else, here in this world, I would have never seen this or heard of your story. I am sure you are overwhelmed with comments, but I just want you to know I am going to be praying for you; as often as the good Lord brings you to mind, it will be done. I just started reading, so please let me know when your boys birthday is. Please know, God never. Ever. Ever will waste a hurt. Oh I pray you have rest tonight.